Silhouette Competitors and shooters all, here you go. 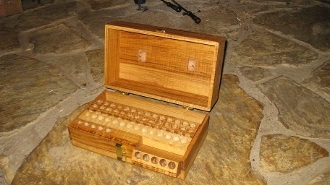 The ultimate in a custom cartridge range box. Woodys box holds 66 rounds, the perfect amount for a 40 round match with 2x 5 count swing doors for each relay. In addition, there's plenty of room for your timer, blow tube, etc. Woodys boxes are the standard for the firing line and you will never regret this purchase. Walnut is standard. Custom wood orders are accepted with a phone call or email. Please specify your caliber upon ordering, i.e. 45-120, 45-70, 40-65, 38-55, etc. U.S. shipping approx. $15. International please contact me for quote.